Interactives - We are turning data into stories! Interactives is a Startup-Company specializing in Interactive Data Visualizations , User Inferface Design and Digital Storytelling . We work with a variety of clients within News Organisations, Non-Government-Organisations, and Public Authorities , who are looking to do more with their data by translating what was complex before, into an easy to understand visual narrative. Often one cannot find the exact data that is needed: it is not in one place. Instead it is dispersed over several PDFs or multiple websites. We help our clients to find data for their stories by scraping it programmaticly out of various sources. Once the needed data is obtained we start the process of converting the data from a raw form into predefined data structures by munging the raw data using algorithms or other suitable tools, and finally storing the resulting content for future use. Having the power to easily understand data no matter how complex provides a competitive edge for any organization. We help our clients finding patterns and relations in their data by applying advanced statitiscal methods. Today, with so much data available, it is critical that the data being visualized generates interpretable information. We create brand-differentiating, cutting-edge interactive Data Visualizations to help our clients communicating information effectively. Furthermore, our visualizations intend to convey stories by combining author-driven elements, which are providing a narrative structure, and reader-driven elements, which are enabling exploration and social sharing. 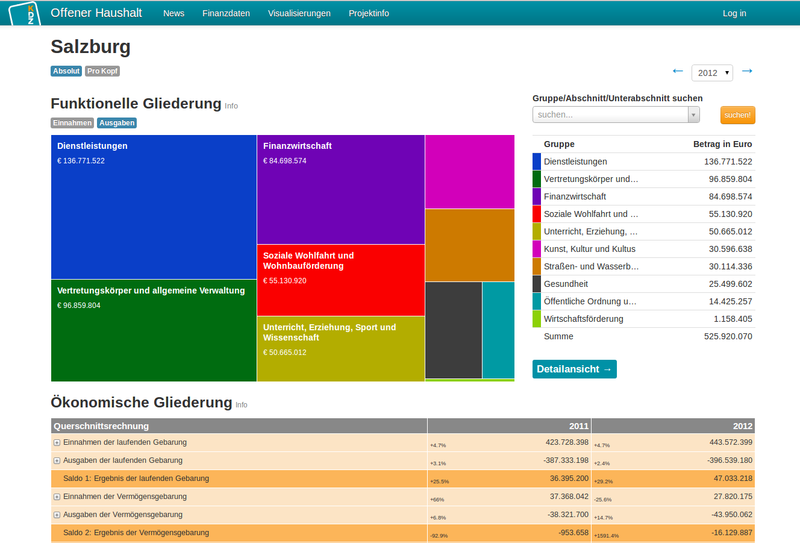 The Open-Data-Platform OffenerHaushalt.at is about mapping money. The aim was to track every transaction across all 2.354 Austrian municipalities and present it in a useful and engaging way for everyone, from the interested public to municipal officials. The maps show in which Austrian municipality a coalition holds the majority of votes. We made this visualization, because elections are not usually won by the party with the most votes. The true winners are those parties, who manage to get a majority of seats in parliament and are therefore able to form a coaltion. Making complicated topics easy to grasp is what we are passionate about: From politics, to sports, to financial data - it is our goal to turn data into meaningful stories. Interactives was founded at a time when journalism globally is undergoing significant changes, especially following the ongoing technological evolution. Media outlets have come under pressure to adapt to new realites posing important challenges for journalism. We are a group of Data Journalists dedicated to bridge the gap between newsrooms and developers. Data Journalism can be considered as a specialized branch of investigative reporting, but the majority of techniques can also be put to good use in everyday journalism. We have experience and expertise in statistics, software engineering, information design and love to tell stories.